– will you be able to complete the course alongside your work commitments? If not, will another member of staff be available to cover some of your work? – will the course be paid for by your employers? 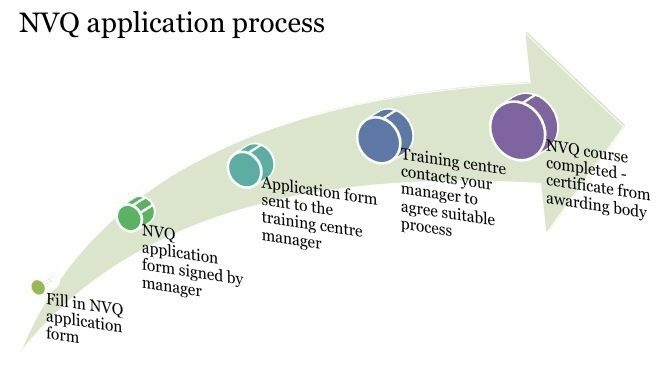 Please view the following diagram for the NVQ application process. It’s advisable to contact a participating school, college, university or centre by phone, email, post or in person. Enrollment will more than likely require your presence as they may need proof of financial support, sponsorship and also identity. Enrollment is usually required a few weeks before the course starts, but you may need to discuss with your course provider as enrollment dates vary. It’s always best to enroll as soon as possible to avoid disappointment. Some courses are extremely popular and places can be taken very quickly. – if government funded, proof of benefits, unemployment etc. Usually you will be asked to pay upfront for the course and provide evidence that it will be paid for.